Restaurant Siege In Somalia Ends With At Least 31 People Killed : The Two-Way It took hours for Somali soldiers to reclaim the pizza place from militants, who took hostages and killed many of the patrons. The attack claimed by al-Shabab opened with a bombing on a nearby hotel. 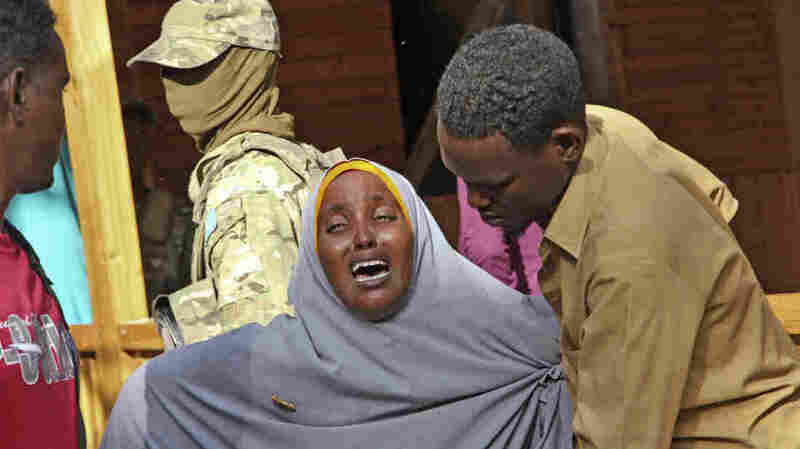 A woman grieves for her daughter, who was shot by militants during an attack on a restaurant in Mogadishu, Somalia. Early Thursday, Somali security forces ended a nightlong siege by al-Shabab extremists at the popular Pizza House restaurant in the country's capital. Somali soldiers reclaimed the blasted and bloody remains of a popular pizza joint early Thursday, ending a nightlong siege that left at least 31 people dead in the country's capital, according to local police. News reports quoted Capt. Mohamed Hussein as saying all five of the gunmen were killed. The militant group al-Shabab claimed responsibility for the attack on Pizza House and the adjacent Posh Hotel in Mogadishu. That attack began Wednesday evening with a car bombing at the hotel's front gates, The New York Times reports, then devolved into a hostage situation at the restaurant. Citing state news outlets, The Times says more than 50 hostages were ultimately rescued by special forces troops. But before they were rescued, The Associated Press says, many of the survivors endured a nightmarish scenario as militants went from room to room, firing at civilians at point-blank range. "I never thought I would have the chance to see the sun again," one survivor told the AP. "They were killing people on sight." "The bodies of five girls believed to have been killed by the extremists were found in the restaurant, police said. The body of a Syrian man who worked as a chef lay near a blood-spattered and bullet-marked wall. "The car bomb that began the attack blew the roofs off the restaurant and other nearby buildings. Many of the first victims were young men who had been entering the Pizza House when the bomb went off, Hussein said. "The extremists, appearing to pose as security forces, then rushed inside the restaurant." The U.S. carried out airstrikes against the al-Qaida-linked militant group elsewhere in the country on Sunday, killing eight militants, according to military officials. And the restaurant siege overnight was by no means the first attack launched by al-Shabab on a civilian target this year. The group's assault on another hotel in January reportedly claimed as many as 28 lives.